An ePOS system in its basic form can just be a point of sale. With a retail ePOS solution, you can survive in the modern retail world that thrives off innovation, adaptability and technological advances. Your retail ePOS solution needs to be a point of service that can deliver an enhanced customer experience whilst being intuitive and efficient. In today’s connected world with omnichannel retail leading to well-informed customers, it is vital that retailers find better ways to serve and provide customers with an superior in-store experience. This is where a modern retail ePOS solution can add that extra intelligence to deliver that bit extra, whilst also ensuring fast transaction throughput to minimise queues, increase customer satisfaction and ensure workflows are seamless. Implemented effectively a retail ePOS solution should help to increase sales, improve cash flow, increase administrative efficiency and improve your customer’s experience. 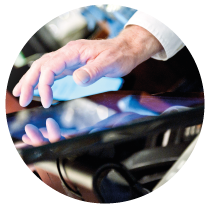 Using modern touch screens our retail ePOS solutions are intuitive, simple to customise and easy to use. 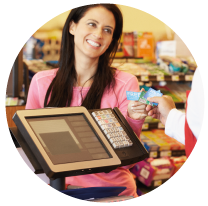 Our solutions provide full support for Chip &PIN, hotkey functionality and live product lookup ensuring speed of transaction at the till, along with many other vital features such as loyalty cards and promotions. Our POS can easily be configured to operate customer loyalty schemes, in-store sales promotions and accept sales vouchers at the till. With a fully integrated database, information is stored and is easily accessible to build valuable information in regards to buying behaviour, trends and stock availability. Our POS can be configured to prompt the till operator to offer multi-buy or special offers at the point of sale. This allows you to easily run daily specials to help move slow moving stock, or up-lift sales by managing consumer behaviour and offering bundles to enhance their retail experience. Effective till design ensures a quick and efficient experience for your customers. Our solutions can be configured for each retailer to design their own till layout to meet their exact needs. 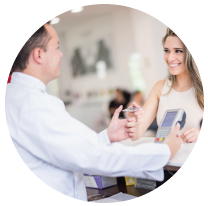 Enhance customer experience by reducing queue lengths, reducing keying errors and increasing sales. With a wide variety of information at your fingertips, it is possible to add new customers, manage their accounts, or see if a customer is over their credit limit. 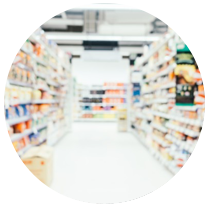 Due to the seamless integration with Sage these records are continuously updated, reducing the need for retail staff to disappear into the back office to get vital information. Understand customers are being dealt with swiftly. No one likes queuing, no one like the wrong change, all promotions and offers controlled. Understand your most profitable and your most popular stock items, both are important and they are not always the same. Understand slow moving lines. Make decision based on valid and up to date information. Increase sales and profit with store promotions increasing customer loyalty and retention. Interested to see how we can make a difference? Right Software for your Business? From the moment you take delivery of your goods, right through to the point of despatch, our barcoding stock control solution for Retail, manages, tracks and controls your stock inventory.